Picture this: You’re driving down a dark road at night and your headlights automatically dim and adjust so that the lights on the car don’t blind oncoming drivers. That’s just one of the many innovations that sets the 2011 Jeep Grand Cherokee Limited 4×4 apart from its competitors. Since its inception in 1993, the Jeep Grand Cherokee has offered world class features, and off road capabilities and a smooth ride that has attracted the attention of consumers for many years. The Grand Cherokee, now in its 4th generation, has evolved into a powerful contender competing with other vehicles in its class. The redesigned 2011 Jeep Grand Cherokee offers a huge selection of standard features and options. The options alone boost the price tag to nearly $50,000 if you opt for the Overland. In addition to the Overland, the Grand Cherokee comes in two other trim levels, Larado, and Limited. The Overland model is a new package recently added to the lineup. Each trim level has its own distinct qualities. 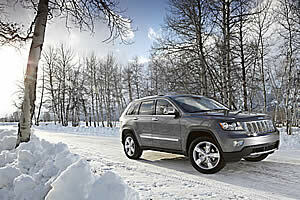 The test car for this review was the 2011 Jeep Grand Cherokee Limited. On the road, the test car clocked a 0-60 acceleration time of 8.9 seconds. I thought that was respectable given the size of the vehicle. The optional 5.7 Liter V8 MDS VVT (Variable Valve Timing) engine, which was equipped in test car, boosts 360 horsepower. But the standard engine is the 3.6 Liter Pentestar DOHC V6 that puts out 290 horsepower. To compliment the engine, the Grand Cherokee Limited came with a multi-speed automatic transmission that features an autostick that gives you the feel of a manual transmission without the clutch. I found the autostick on the test car not as fun as other vehicles with this feature, because it felt more like the vehicle was still controlling the gears rather than the driver deciding when to shift. One thing I noticed about the autostick feature was the short gear upshift change between 2nd and forth gear, which prompted an immediate gear change when using the devise. Upon acceleration, I found that the engine would vibrate at higher engine speeds, which was noticeable in the cabin. The fuel economy was rated 20 MPG highway. The braking on the Grand Cherokee was respectable, with its four-wheel anti-lock brakes helping to stop the vehicle. But, when you apply the brakes, you have to give it more push to get the brakes to react in normal driving. The Grand Cherokee Limited handled very well on tight corners and had an excellent turning radius. All of the wheels were planted firmly on the ground thanks to electronic stability control. The test car also came with unique features that set the Grand Cherokee apart from its competitors. Jeep described hill assist as a feature to, “helping drivers when starting a vehicle from a stop on a hill, by maintaining the level of brake pressure applied for a short period after the driver’s foot is removed from the brake pedal. If throttle is not applied within a short period after the driver’s foot is removed from the brake pedal, brake pressure will be released.” Also, the Limited came equipped with hill decent control, which allows the driver to have more control when on slipper slopes without the driver needing to apply the brake. Other unique features include the select terrain, which gives drivers the choice of five modes. The auto mode is for every day driving conditions. Mud/sand mode maximizes traction, and provides additional wheel slip. Rock mode activates the vehicle decent. Snow mode is tuned to maximize traction. With some of these selections, the Grand Cherokee will raise or lower depending on the setting you use. If you live where winter conditions are harsh, the snow mode will engage and lift the ride height to prevent the salt from damaging the underbody. The Quadra Trac II 4-wheel drive system is also associated with the direct terrain system. Something unique that you would notice immediately is the quiet interior. This is the direct result of the sound absorbing insolated widows, which helps minimizes the noise level in the cabin. With all of the windows up, the only noise that you hear is the engine revving. Another unique feature was the auto trunk lift and lower. With the push of a button, the truck will open and close automatically. Before the liftgate closes, short beeps will sound to let the consumer know that the trunk is closing. The interior was impressive with lots of features that promote the ultimate driving experience. The rear back up camera was available on the test car. I found the big display located on the instrumentation panel to be clear and easy to read and is like having an extra eye from behind. Also the Grand Cherokee Limited came with an optional 6.5 inch touch screen display with a built in navigation, and a 30GB hard drive, which can hold up to over 4,200 songs. There is also an i-Pod connectivity port that allows consumers to enjoy their own music. Also available is satellite radio. The satellite radio is a package that goes along with the 9-speaker premium audio system, providing 506 watts of power that sounds amazing. The wood trim was also a nice touch, which made it feel more luxurious. The heated steering wheel with audio controls on the test car is an option on the Limited. I found the volume controls easy to operate. The Grand Cherokee Overland came with a wood grain steering wheel with leather as well. I think that the heated steering wheel would come in handy during cooler months providing an instant hand warmer. Another interior feature was the heated leather seats for the front and rear occupants. The test car also came with cooled front seats, which is considered an option on the Limited. There is an available DVD system, for passengers to enjoy. But the driver can also enjoy a movie or two, provided that the vehicle is in park. The 8-way power front driver and passenger seats allow the consumer to select their ideal comfort zone. Interestingly, the rear seats have the ability to recline. There are also vents in the rear that the rear passengers can enjoy. The most convenient interior feature was the push button start, which means you can essentially ditch the keys all together. The Grand Cherokee Limited also came with Bluetooth technology the consumer could pair with their cell phone device directly to the vehicle. The gauges and electronic vehicle information center with reconfiguring display, allow the consumer to monitor the vehicle’s fuel economy, distance until empty, and other important information. The exterior of the Jeep Grand Cherokee Limited is just as impressive as the interior. It came with a command view dual pane panoramic sunroof that gave the driver a chance to enjoy the sun, and allowed the rear passengers the ability to enjoy the view. The most interesting exterior feature was the headlights, which had an amazing miniature seven slot grille embedded in it. The Limited came with Smart Beam Bi-Xenon High Intensity Discharge Headlights with auto leveling. The auto leveling system helps reduce the bright glare that is sometimes associated with brighter headlights. It automatically lowers the aim of the headlights to avoid oncoming drivers from being blinded. This system aims the lights according to the vehicles load (higher in the front and lower in the back). Other exterior features include standard 18-inch aluminum polished wheels. However, the test car came with the optional 20-inch aluminum premium painted wheels, that added a nice touch. The overall wheel options include 17, 18, 19, and 20-inch wheels. Finally, there are the heated power mirrors that helps keep the mirror clear. Fog lights are also available that provide more lighting in foggy conditions. As far as safety, the Grand Cherokee Limited will give you peace of mind by offering advanced multi-stage front airbags. It also offers supplemental side-curtain front and rear airbags, and front seat side airbags, which gives all around coverage in the event of an accident. Overall the Grand Cherokee Limited offered world class features that pave the way for innovation. I think that this redesign will attract consumers looking for something unique and different, something that can’t be found on vehicles in its class.